Carved out of harsh limestone and edged between the brilliant white limestone cliffs and the endless blue horizon of the Indian Ocean, this championship golf course ranks among Asia’s best and most challenging. Experience this championship layout firsthand to discover much more than just a golf course. A magnificent Clubhouse with one the best venues boasts a restaurant, bar, spa and function rooms with panoramic views of the lush rolling fairways and sea. Overlooking the 9th and 18th green of the golf course, the Link Restaurant is open daily from 6am for breakfast, while also catering for lunch, morning and afternoon teas as well as light snacks all day until 7pm. A la Carte dining is available every day of the week, with buffet style on request. Dine in air- conditioned comfort amid a backdrop of lush rolling fairways, native landscape and rolling waves of the Indian Ocean or simply enjoy Terrace and watch the golfers finish their rounds. The Atrium is large sea of open space and shape, which flows from The Link Restaurant & Bar through the Clubhouse and is a popular venue for pre and post event functions. There is even a look out tower beside the clubhouse where members can climb up to watch the magical sunsets so typical of Bali’s magic. Named for the solitary tree which growsout of the left fairway bunker. A generous fairway for the opening shot of your round. Aim your tee shot between the left and right fairway bunkers, or more to the left as there is Out of Bounds on the right. The green slopes from back to front and has 2 distinct tiers. It is guarded by a large bunker on the right and banking on the left and at the rear. Pro’s Tip – The first green gives you a good opportunity to familiariseyourself with the “grainy” greens. The grain here, as it does throughout, lies in the downhill direction i.e. away from the hills and towards the ocean and putts will roll out much more in that direction. Another tip for “seeing the grain” is that if you look up this green (into the grain) you will note that it appears to be of a much darker colour than if looking down it (with the grain). Named after the Balinese mythical lionlike creature. The Barong is the King of the spirits, leader of the hosts of good and enemy of Rangda, the Demon Queen. Like the Barong when dancing, this hole weaves - left to right and up and down over its long length. If the first was fairly straight forward, the second is most definitely not and gives the player an insight into the demanding challenges that lay ahead. 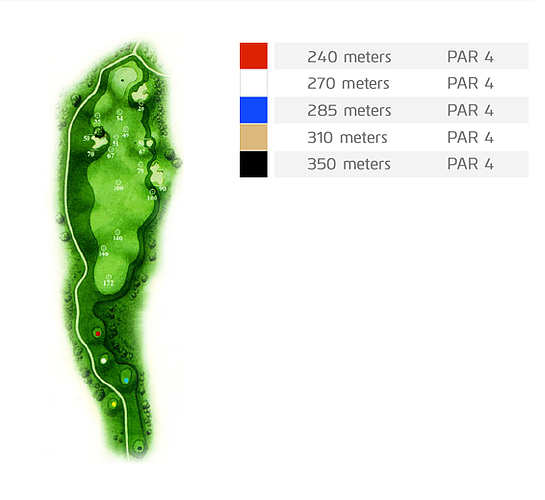 Four large fairway bunkers flankthe left side and thickly wooded, rocky ground runs all along the right. 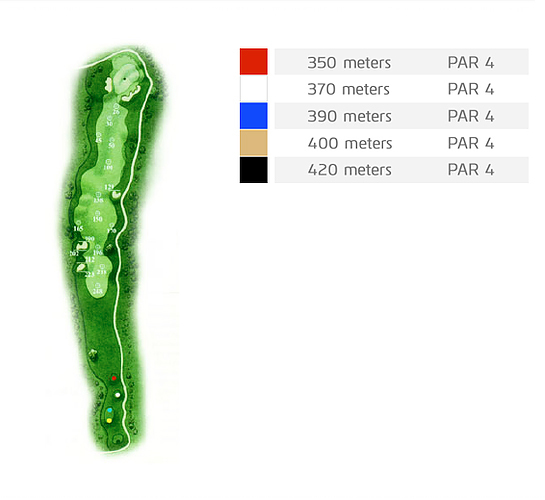 The green drops away from left front to right rear, has a very narrow opening and is defendedon the right by a massivebunker that extends 35metresback down the right side of the fairway and on the left by another bunker. Pro’s Tip – A conservative approach to this 3-shotter is recommended as trouble lurks everywhere. Stay on the fairway and position yourself to play a full shot or a high spinning lob onto the green so as to be able to stop your ball close to the hole. Be carefulto not short-side yourself on the left as the gradient and grain of the green makes it virtually impossible to get up and down from here. Named after the Balinese mythical child eating creature. Rangda is the Demon Queen who has claws, pendulous breasts and long unkempt hair. She leads an army of evil witches against the leader of the forces of good – the Barong. Considered by many to be the toughest hole on the first 9, this is a formidable par 4 especially when played into the prevailing wind. There is a slight left to right dogleg running down to the green whichlike the second has a narrow opening between its greenside bunkers. Pro’s Tip – There is little margin for error here. Your tee shot should favour the left side of the fairwayto give the best angle of approach and to keep well clear of the severe rough which borders the right. Your second shot must either carry the bunker which stretches across most of the front of the green or through the small gap between the bunkers. The green however is receptive to a well-judged approach as it slopes from back to front. Named after the Indonesian words for “Be Careful”. Hati-Hati features arugged creek bed (usually dry) which cannot be seen from the tee and which crosses the fairway 30 metres short of the green. About 100 metres from the green there are fairway bunkers on both the left and the right. 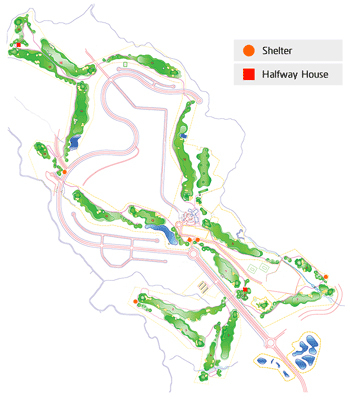 The green itself is guarded by a bunker on the left. On the right the ground drops away sharply, making for a very difficult up and down from here. 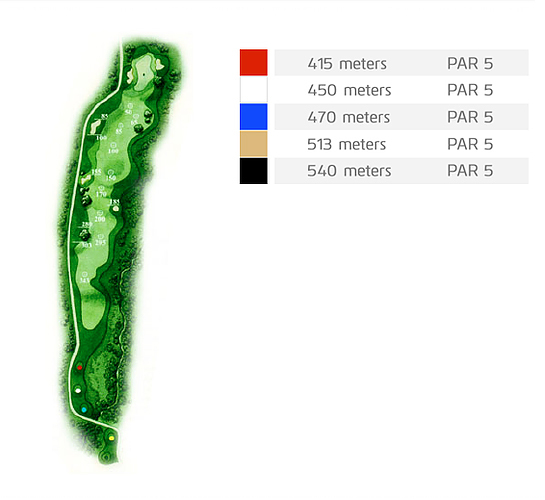 Pro’s Tip – This short par 4 offers a realistic birdie chance. Leave your driver in the bag and lay up just short of the fairway bunkers. This will leave you with only a short iron approach into a receptive green which slopes from back to front. This is another green where the effect of the grain can be significant to the roll of your putt, so pay attention to it. Named for the many Kapuk (or Ceiba) trees whichfeature onthis hole. Lots of these trees can be found around the course, especially on the first 9. From October to December, the pods fall and the fine white/yellow Kapuk fibres (Kapok in English) spill out over the ground. Kapuk is mostly used as an alternative to down. The bark of the tree has been used as a diuretic and as an aphrodisiac. Your tee shot should favour the centre right side of the fairway to open up the approach. The leftside has many uneven lies and patches of tall grass. A bunker borders almost all of the right edge of the green and as the green slopes from right to leftis to be avoided. Also note that Out of Bounds borders the road at the back of the green. Pro’s Tip – You may choose toagain leave your driver in the bag to minimize the risk of the Kapuk tree on the left side of the fairway from obstructing your approach. Look to leave yourself an uphill putt on this moderately sloping green. 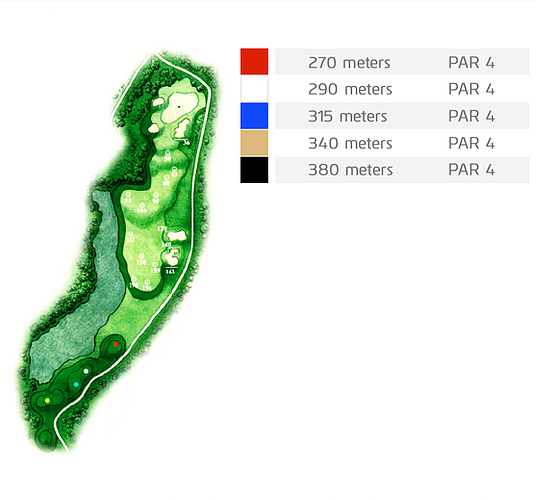 Named after the course's principal architect, Ronald Fream who says "Hole 6 is our standout par 3. We had ample space to be different. 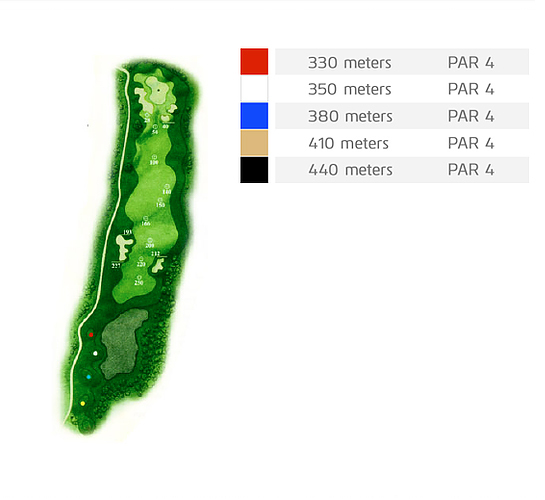 This large space allowed the use of expansive alternate teeing surfaces, and a vast area of intimidating sand." Pro's Tip – Careful club selection is of paramount importance as this green is the most exposed on the course to any wind that is blowing. Once on the greenyour job is not over as the many undulations will require concentration to get your putt close to the hole. An outstanding golf hole that provides a visual treat from the tee withfairway bunkers, a usually dry creek bed and an elevated green guarded by a cluster of bunkers at the front all in sight. Shorter hitters will be well advised to play this hole as a par 5 by layingup short of the creek to make for a much easier approach. This has a cross diagonal green – nearer on the front right and back on the left. Pro's Tip – Aim your tee shot to the left side of the fairway to give a flatter and tighter lie for your second. Remember when playing your approach that the green is uphill from you. The table top type green slopes slightly from left rear to right front. Named after the colourful Kamboja trees (Frangipani in English) which are both abundant in and synonymous with Bali. The blossoms are very fragrant and popularly used by the Balinese for offerings and for hair decorations. The Balinese call it Jepun and many fine examples can be found growing around the green and the Clubhouse. 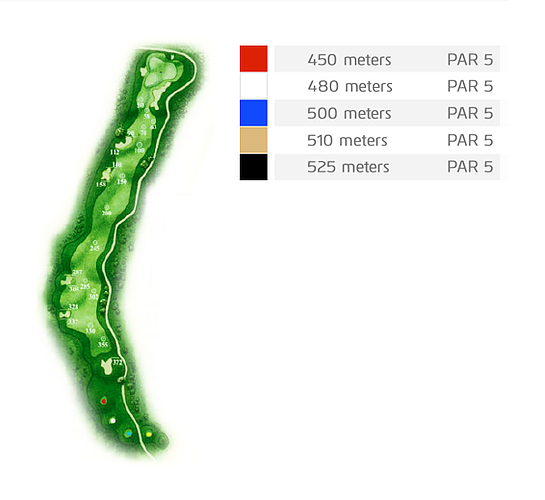 The shortest par 5 on the Course which features a left to right slanting fairway and a deep,well-guarded green. The elegant Clubhouse provides an attractive backdrop. Pro's Tip – A good birdie or even eagle chance. Your tee shot should favour the left side of the fairway as on landing your ball will roll in towards the middle. If you choose to lay-up be sure to get past or to the left of the trees that encroach on the right side of the fairway. The long green although seeming to have a moderate gradient from back to frontactually plays at about the same speed in either directiondue to the grain. If you are fortunate to be near this hole early in the morning or late in the afternoon, you will surely be delighted by the vivid colours of the sky being reflected in the still waters of the lake. An appealing hole all laid out in front of you to start the back 9. 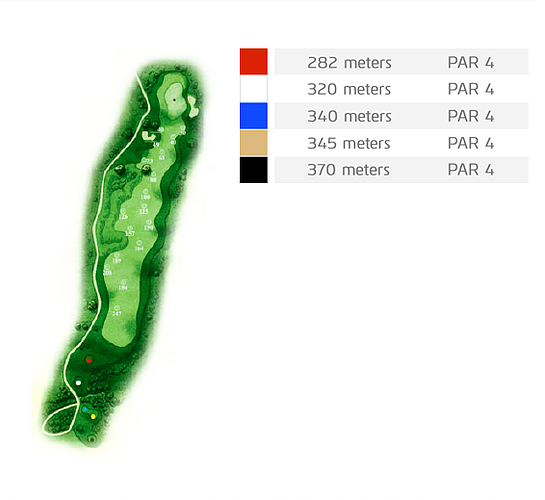 Pick your line across the lake – the bravest and longest hitters will aim just to the right of the green. Think positive thoughts and don’t let your mind wander to the water. This green has the most back to front slope on it than any other on the course and is guarded by twobunkers on the left and another on the right. Pro's Tip – Landing your approach shot belowthe hole is crucial here so as to avoid a very challenging downhill putt. From the tee look down the bowl of the fairway where you will find, perfectly framed, the beautiful deep blue ocean which will attract your eye for the next six holes. You are starting on the most scenic part of The Links Challenge, a string of holes that will have you reaching for your camera at every turn. An excellent par 4 featuring a left to right dogleg and then down a shallow valley to a saucer shaped green. 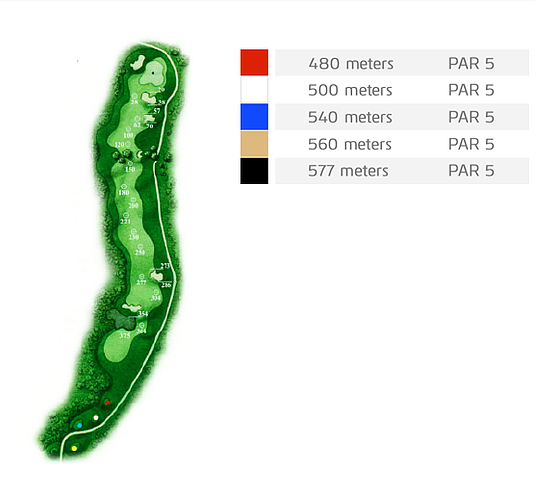 Big hitters may choose to hit a fade over the bunkers in the middle of the fairway to give a much shorter approach. The green slopes from front to back and is defended by a bunker front left and banking on the right. 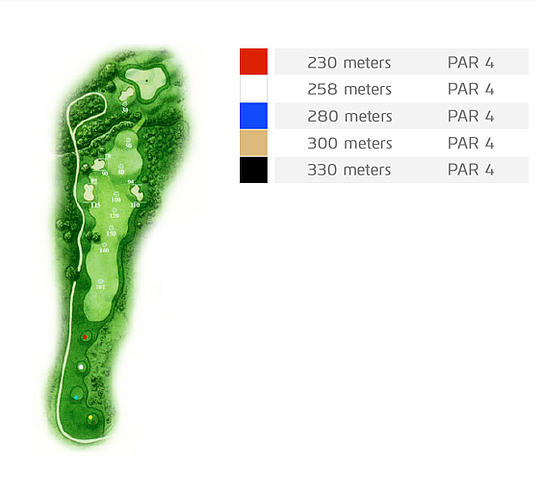 Pro's Tip – The downhill pitch of this green results in many balls rolling on through to the back. It is best to land your approach shot just short of or at the very front of the green and let the slope carry it on. Pro's Tip – Like all par 3’s correct club selectionis vital andis especially important here so your ball lands on the portion of the green where the flag is located. Putting on this green is as difficult as it gets,as apart from the effects of the saddle, the grain adds subtlety too. 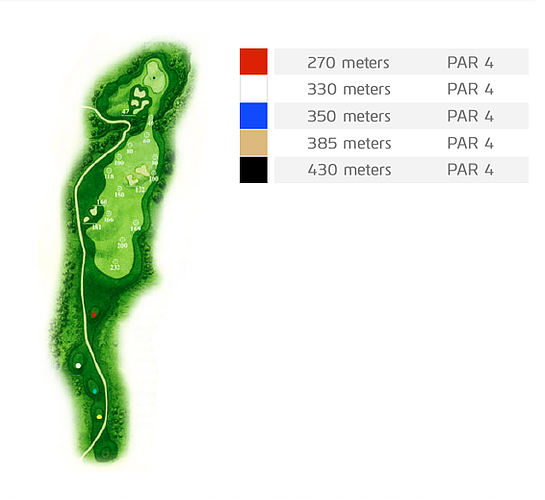 Named for the swathes of Alang-Alang grass which can be found growing around the tee, on both sides of the fairway and on the right side of the green. Alang-Alang grows in dense masses and is up to 100cm in height. The blades are about 2cm wide with the tips being sharp and pointy. In Bali Alang-Alang is often harvested, dried, tied in bundles and used as thatched roofing for houses, bales and other buildings. A tough par 4 that doglegs from right to left with the green being hidden from the tee. There are fairway bunkers on both sides which need to be avoided. The two tiered green slopes from front to back and into the middle from the left and right. It is well defended by a large bunker on the left and two bunkers on the right. Pro's Tip – The best line off the tee is just to the right of the left side fairway bunkers. The green has a narrow opening which can be used to play the classic Links type approach of running the ball onto the green. If the pin is located on the top tier, then your approach must fly high and land softly to get close. Named after the famous Dreamland Beach which can be looked down upon from the back of the green. The view from the tee is simply stunning but it gets better as you progress down the fairway as the whole of the gorgeous bay opens up to you. This entire coastline is one of the World’s top surfing locations. 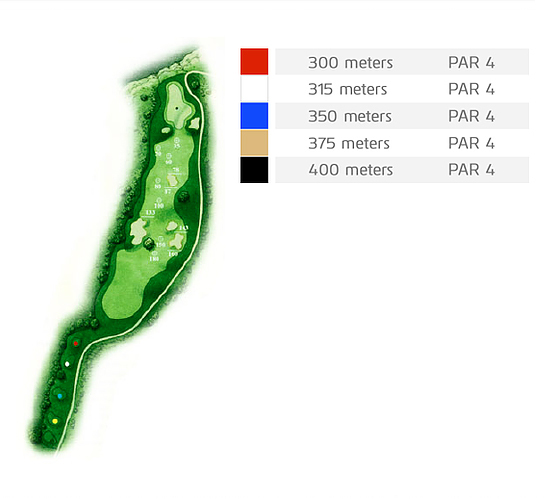 A difficult driving hole as your tee shot needs to negotiate the many bunkers and find the fairway. 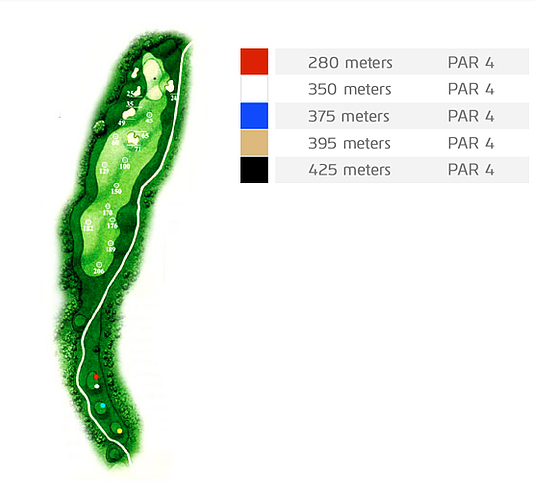 The left side offers the shortest route, but the big bunker coupled with the impenetrable rough on this side make it the most risky line to take. To state the obvious, be wary of hitting too long an approach shot into this green or your ball will tumble off the cliff and never be seen again. Pro's Tip –It is prudent to favour precision over power for your tee shot here. Your approach shot must carry the gaping, steep faced bunker front left. The undulating green is further guarded by a bunker front right, banking on the right and precipitous drop offs at the left and rear. A spectacular but demanding hole and especially so when the wind is blowing. "The Cliff Hanger" half-way house is a wonderful place to refresh yourself and enjoy the magnificent views of the sweeping bay which ends at Uluwatu, site of one of Bali’s four most sacred Temples. This is the Signature Hole and as you stand on the tee and take in the 240 degree ocean views, you will understand why this is one of the most photographed hole’s in the world. Pro's Tip – The wind can play tricks here because it can be different on the tee than at the green,as it gets funnelled up and around the different parts of the cliff walls. Take a moment to look at both the flag on top of the half-way house and the flag on the green to get a good feel for the winds true direction and strength. By a trick of perception, the green is actuallya bit flatter than it appears. Balangan is the name of the stunning white sand beach to the left of the tee. There are few more picturesque tee locations anywhere. 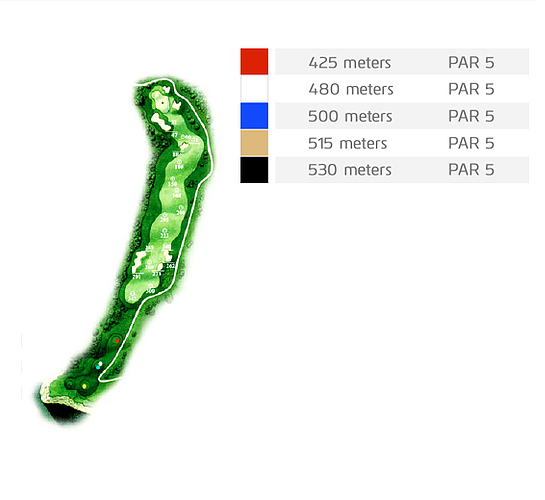 However, you are now embarking on three of the toughest closing holes in golfwhere many a match has been decided and a good scorecard ruined. For a unique view,walk to the championship tee to look down on the surfers taking off on the perfect waves that wrap around the cliff. 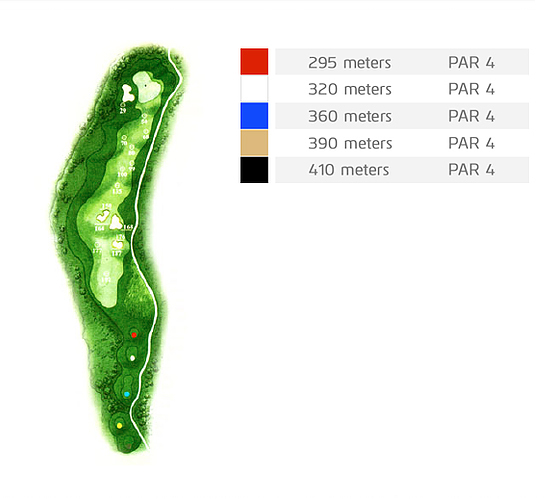 This long par 5 is classic Links territory – it usually plays into the wind, has a rumpled fairway which follows the natural contours, penal rough, many bunkers and a largebut well protected green. It is fairly straight for most of its length but then doglegs right to left – the green cannot be seen from the tee. Pro's Tip - From the elevated tee this at first appears to be a big-hitters delight, but take heed as the gap between the left and right fairway bunkers is narrow. It may be a good idea to position your drive short of these bunkers. If you can go for the green in two, be warned that there is a hidden bunker front left. 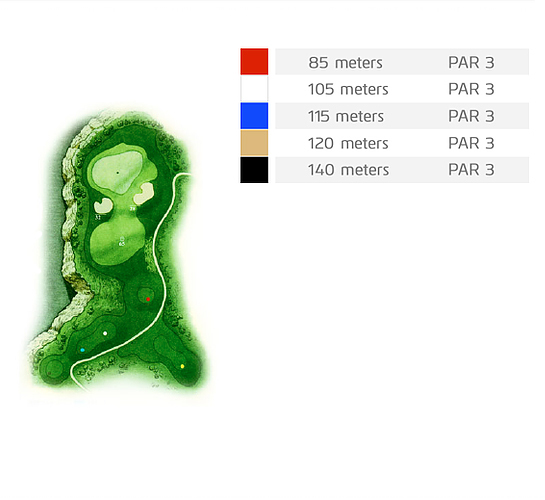 The safer option is to play this as a true 3-shotter; in which case play your second to the right of the kidney shaped bunker in the fairway as there is plenty of open space out here and makes for a much more straight forward approach. Named for the steeply sloped green that is the main defence of this slight left to right dogleg par 4. 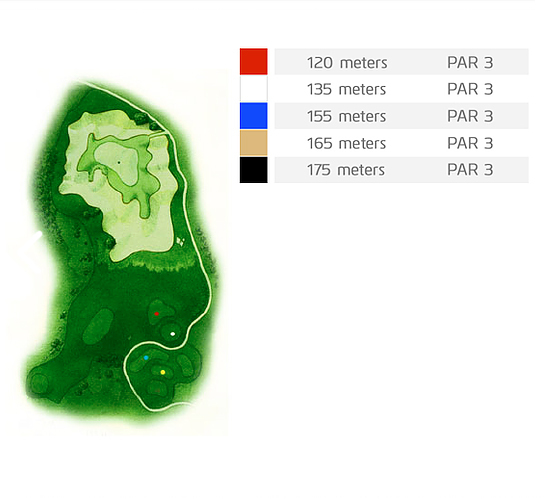 The green is protected by a severe drop off and two bunkers on the left and on the right by another bunker and steepbanking. Pro's Tip – This is another hole where you may choose to leave the driver in the bag and play for position off the tee, as any drive drifting left will run out of fairway. When contemplating your approach to this very deep and undulating green, keep in mind that you need to get below the hole. Anything left above the hole will result in having to putt down the slippery slope. 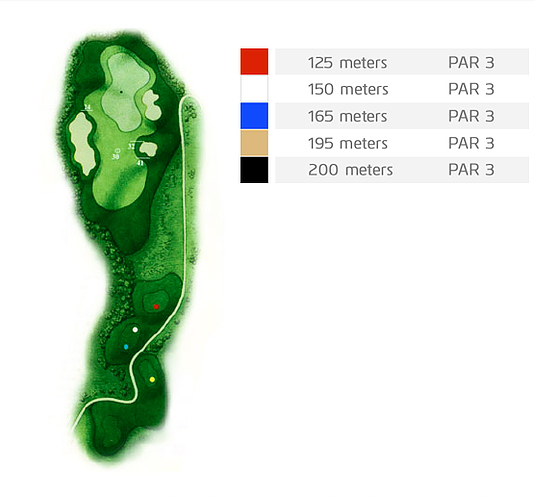 Unlike many closing par 5’s in golf, this is not a par 4.5. This very long, double dogleg brute is a true 3-shotter and can be quite daunting for short hitters. There is Out of Bounds along both sides of the fairway and at the back of the green. 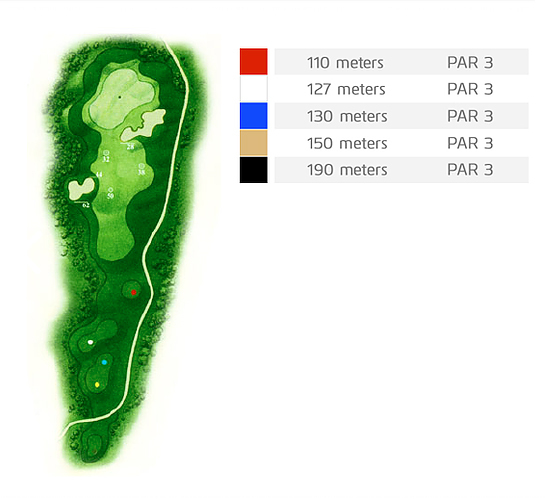 There are many bunkers, trees in the fairway and the approach shot to the green is often played blind. There is even a small lake to contend with. Make no mistakethis is a tough finishing hole where to secure your par will need both soundstrategy and good shot execution. Pro's Tip – From the elevated tee, although tempting, there is not much to be gained by cutting the corner. The saferline for your tee shot is to the right of the fairway bunkers. For your second shot favour the left hand side of the fairway or your approach to the green may well be impeded by the trees on the right side. When playing your approach shot, make sure to take enough clubas it is commonly played from an uphill lie and into the wind. The green slopes moderately from left to right.